Little could I have predicted where this would go, when I first landed in Mumbai nearly seven years ago after having knocked together one of the worst-designed websites ever loaded by man or woman (see picture, above). I was staying in a cheap hotel near Crawford Market and literally did not know a soul in India, beyond a handful of fleeting phone conversations with a few law firm managing partners from my time at The Lawyer magazine in London. To be honest, I had no idea what I was doing, as I was setting up my first meetings and making my first cold calls to phone numbers of Mumbai and Delhi law firms I found in the legal directories, perhaps evidenced by a curious interest from many as to why anyone would want to be reading about what goes on in Indian law firms and the legal profession (as well as why I had left the UK to set up a legal website in India). I still don't quite know why I did it but it has been hugely rewarding being here in nearly every way, and I could never have imagined the warm welcome and response Legally India has received. 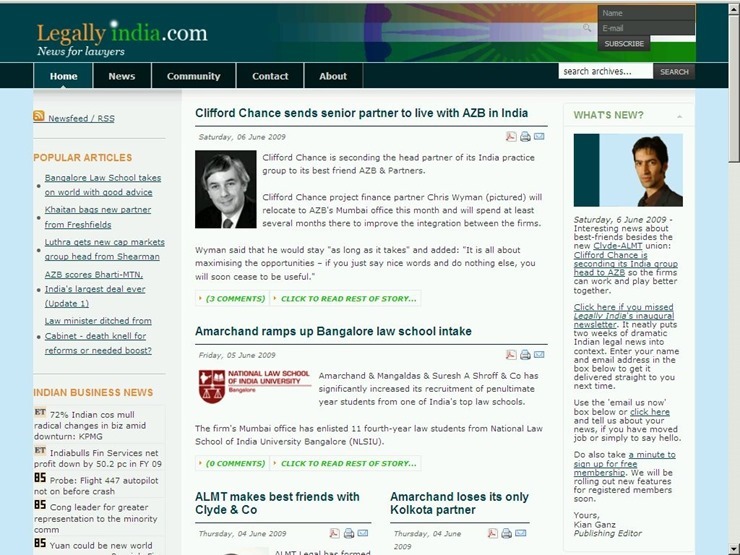 There are now many other websites doing similar things as Legally India but I would like to think that we have retained our first-mover advantage, not just in terms of the size of our audience (which is now at more than 200,000 unique visitors every month), but also in terms of the depth, breadth and impact of our coverage (although, as I'm still doing the coding of the site myself, it's still not much to look at). In any case, if you are reading this, you probably know why you are here (and whether you like, love or hate what we do). Also know that Legally India has been a labour of love by everyone who has worked and works with us (a massive thank you at this point especially to Neha Chauhan, Divya Mehta and and Prachi Shrivastava for having been there, and Mooting Premier League (MPL) correspondents Vinay Mishra, Sanjay Khan Nagra, Prashanth Ramdas, Annie Mampilly, Arvind Ravindranath and Saksham Dwivedi) as well as the dozen of other part-timers and temporary members like Court Witness and many others). We do and have done our best to inform, delight and entertain our readers, and hold to account, in our tiny way, the power structures and institutions that had been shrouded in secrecy for a long time. And I believe that at least an equally huge part of LI is the community of well-wishers, including our readers (many of whom visit many times per week, day or even hour), our tipsters, contacts and sources (both anonymous and otherwise), and the many many contributors, bloggers and – last, and of course not least - the commenters. While we have had to fight many hard battles for your right to be enlightening, critical, funny, anonymous and sometimes just plain silly, I think it’s been worth every legal notice and shouting match (I’m also very happy to say that we’re nearing nearly 100,000 comments on the site now). Anyway, you all know who you are. Back to business. Legally India runs on a shoestring with only two full-time staff, without any investors or wealthy backers, and the commercial side of Legally India has always come second to our editorial independence and credibility. make our first attempt in getting our greatest resource – you – to help us grow to the next level. Cutting a long story short, we need more time and more people if we want to continue doing justice to this huge market with more honest reporting, important investigations, insightful longer features and analysis, and also the occasional bit of unapologetic fun. Over the past few weeks we have been talking to a lot of people and have run surveys on a sample of our readers about how we can involve you more and how you would like to contribute. The global news industry is in the midst of a crisis and there are no easy solutions that retain independence and quality. And, unlike many others, I don't think the answer lies in restricting access to content with a paywall: important information should largely be free and accessible in perpetuity by the widest number for it to have any meaning and benefit to the greatest possible number, whatever their means. However, I do believe that our most loyal and supportive readers for all these years deserve more of our love and labour, in the form of additional useful services, early insider information, context and much much more. here to become a Partner Subscriber (Rs 899 per month). Some of these things will be delivered to you exclusively by way of our new and revamped weekly email newsletter. Our newsletter will be the only thing that you need to read to catch up on the week's important legal happenings, and it will be chock-full of analysis, exclusive news and insider information and gossip that we can not publish on the web. I promise that you’ll love it! Our previous newsletter that had run for more than 100 issues was hugely popular but has been mothballed due to insufficient resources in recent years. But your support will change that. All paying members will also get automatically guest listed for all future Legally Social parties in Delhi, Mumbai and Bangalore. And all subscribers will be part of an exclusive and trusted club of stakeholders that we will consult regularly on our editorial direction and policies, as well as ask them for their opinion on the legal market, which will form the basis of future editorial. Plus there are a whole raft of other benefits that we've carefully curated for you (such as an optional bit of extra bling for your Legally India comments), and I promise that we'll keep adding useful new features that our members will see first and usually also exclusively. And of course, should you want it, your privacy and anonymity remains one of my top concerns. I have worked hard in the past year to reduce Legally India's use of sites such as Facebook, Google or Twitter, that track you across the internet, and I promise that we will still not know (nor want to know) who is hiding behind your anonymous comment (just like with non-paying subscribers). The second tier of membership for the more regular Legally India readers will include all of the above, plus give you a much sleeker, advertising-free version of the site, and a few more benefits that we'll be rolling out. The top tier, in turn, will have much faster usability like ‘instant articles’ and other features for those lawyers who can afford a bit more luxury and want to support the work that we do (and we'll be adding more exclusive features, goodies and perks for you too, of course). It only takes a few minutes to sign up and complete payment below (even if you're abroad), and, because we love you, you won't even ever need to remember any passwords or usernames. Finally, if you are still considering it, consider this: if you change your mind about being a subscriber in the first few weeks, we will be happy to refund your entire subscription fees to you. I look forward to hearing your feedback, suggestions and more in the comments, as well as your support, whether financial, moral or otherwise. And a very big thank you again for having been there with us for part (or in some cases all) of these wonderful last seven years (and hopefully for the next seven too). Sorry all, just got word that comments were accidentally disabled on this post! I have always enjoyed going through Legally India and fully support this payment model. I think it is imp for publishing houses to be independent and they should be able to sustain themselves. Thank you so much dear Reader, I really appreciate your support! All the best Kian and Team LI, past and present, and many happy returns! I am happy to sign up and support you, I think it's a great idea. And I don't normally comment on Legally India but am curious to try out this badge so here is my first comment in a while. Thank you A. Loving your badge! By the way, for those wondering how the badge works, after you subscribe you basically get the option when posting a comment to post it with a badge. So, for example, if you have a nickname you often use when commenting on LI but don't want anyone else to know that you are a subscriber and a commenter (maybe everyone in your office knows you subscribed, and suspects you might be commenter X), then you can deactivate the badge. In any case, no information about subscribers' identity (beyond the usual IP address etc) is sent or stored for comments - all that's stored for the badge is whether someone is a subscriber or not. Plus, I promise, that I literally have zero interest in being burdened with any commenters' real identities (unless they choose to share it of course ;) I think it's more fun that way, plus privacy is awesome. Going forward I'm thinking about even removing IP address checks for subscribers (and maybe general visitors) completely, so we literally don't retain any permanent records at all of your visit (so even if law enforcement asked us to hand an IP address over, we actually physically couldn't). The paid subscription link is not working right on my windows phone. I tried twice but both times it keeps going back. In the meantime, can you please try these links? If you have any queries at all, please let me know. Happy to support your tough stand on many issues that you have taken up which the mainstream media is too scared to do. Small contribution towards that. Kian which you all the very best! Yes it is, very visible. Any suggestions for funkier badge designs or other perks commenter-subscribers would enjoy, please do share! Very proud to be a part of the journey, Kian. Here's wishing for many more years to come. Cheers!! I'd love to give an answer to that, but honestly, it probably changes from month to month, plus it'd attract a lot of controversy. Warmest most personable person senior partner, probably the one everyone in the market could agree on would be Rajiv Luthra. Though Haigreve Khaitan might share the top spot there, perhaps. And Bahram Vakil too would deserve a mention there surely? Genius partner is a little hard for me to tell, since I don't really work with them on legal work so it's hard to judge. Then there's also managing partner with the biggest hat and mansion, Rohit Kochhar. The most formidable force of nature award might have to go to Zia. Most chilled-out, sensible partner, have a few in mind but can't name names. Actually like the way the website looks in that pic.. sorta retro cool.. Started reading LI in 2009 when I was in the final year of law school - been reading ever since - you've helped kill a LOT of time spent waiting in court over the past 7 years. Happy to subscribe and have the ad-free version now. P.S. A couple friends and I started reading LI back in the day only because we thought Kian was terribly good looking - stuck around for the high quality content ;-). I am willing to subscribe to LI but all my comments should be tagged/marked interesting. Bolo, chalega? Kian you did misreporting recently. You claimed a few days ago that Vijender Kumar may be appointed as MNLU VC and he is thinking about leaving NLU Assam. FYI he has already been appointed and taken charge. See below. Hearty congratulations on completing 7 years and keep up the good work. Make it with some image/clip art background perhaps? It is the worst thing to happen to the legal profession. its like legal stardust. You guys just gossip and make money out of what is supposed to be a noble gentleman way of life. You have brought the standards of legal profession to a low and continue doing that each day. An amazing place to work and the best boss ever - kudos Kian! Congratulations to the entire team and I am confident Legally India will soar to greater heights by the end of the decade! You have done a fantastic job right from Day 1. Have loved everything (mostly) so far. Love the new double-spaced format. I shall contribute. Wishing you every success in taking Legally India to the next level.